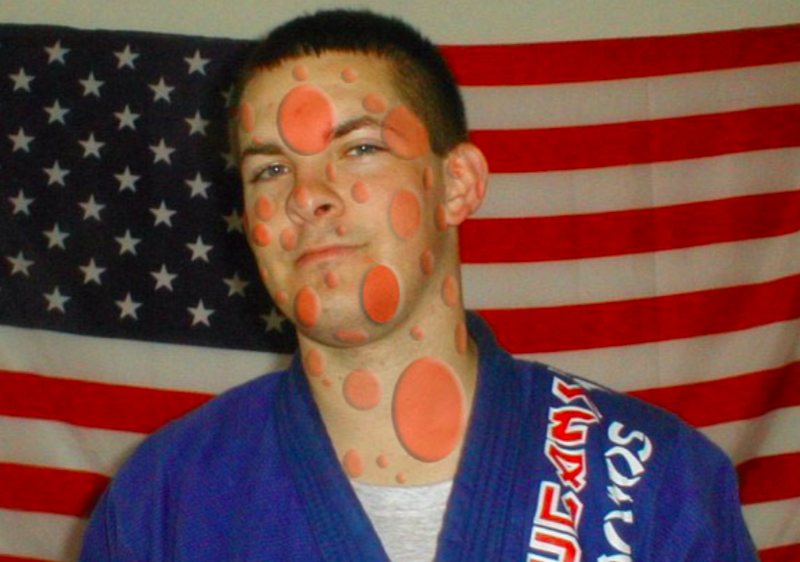 Due to constant skin-to-skin contact, infections of the skin are a common and unfortunate part of Jiu-Jitsu. The prevalence of such conditions has changed the way many people look at the sport, and there have been many misconceptions about something that arguably is one of the greatest health concerns among athletes in the 21st century. The issue is with the lack of education about skin infections, especially in preventing and treating them. The truth is that most types of skin infections in Jiu-Jitsu are extremely minor and only become a major health issue if they are not cared for properly. The most common types of skin infections in wrestling will be discussed in this guide. They include: Ring worm, Herpes simplex, Impetigo, and Staph/MRSA. This guide will give you some general knowledge on these infections, and at the very least, will also help you understand and identify their signs and symptoms. Disclaimer: This guide should not be used as a diagnosis, or in the place of a physician’s opinion. What you’ll read here is simply a gathering of commonly known, beneficial information that should be shared by wrestlers, parents, trainers, coaches, and anyone else involved in the wrestling community. If you or someone you know has some of the symptoms discussed in this guide and suspect an infection is present, talk to a coach first. He or she will help you through the process of diagnosing and treating any skin infection. Ringworm (Tinea corporis) is a type of fungal infection that can be contracted almost anywhere on the body. When contracted on the feet, this infection is known as “athlete’s foot.” On the groin area, it’s called “jock itch.” The name is misleading, because there is no actual “worm” involved. One of the most common types of skin infections, ringworm appears on the skin as a raised circle or ring. It is typically red or brown around the edges with scaly, peeling skin throughout. Ringworm thrives in warm, moist areas and can be contracted from many sources, including but not limited to: Unclean locker rooms, clothing, showers, mats, and of course, skin-to-skin contact with infected individuals. Ringworm can also be found on some animals. 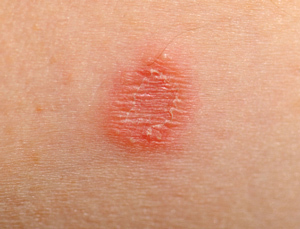 Ringworm has a very distinctive appearance, and typically appears in the form of a ring-shaped, itchy rash that is slightly raised above the skin that surrounds it. Every case is different, and sometimes it will not appear in this shape and may not be irritating. Sometimes, reddish or brownish bumps appear in addition to scaly, peeling skin. It is also common to contract ringworm in difficult places to view, such as the scalp or underneath the fingernails. Most cases of ringworm are extremely minor and can be treated with over-the-counter, topical medications that are commonly used for fungal infections. Make sure to follow the directions of any medication exactly. It may take several days to several weeks for the infection to be healed, depending on severity. “Lamisil” is a good cream that works wonders. Often times, your doctor will be able to identify ringworm with a quick examination of your skin. If your infection is strong, oral antifungal medications may be prescribed in addition to prescription topical medications. After a few days of treatment, ringworm becomes non-contagious, although it is still apparent on the skin. It may take up to several weeks for ringworm to completely disappear. Herpes simplex (Simplexvirus) is a viral infection that can be classified into two separate categories: Type I and II. Type I is the kind that is associated with the sport of wrestling, which is in the same category as cold sores and fever blisters. Type II is associated with genital herpes, and is virtually non-existent in Jiu-Jitsu. Both types of herpes can infect nearly any part of the body and are highly contagious. Although there are several types of herpes that can be contracted in wrestling, Herpes gladiatorum is the most common, earning the name “Mat Herpes” or “Wrestler’s Herpes.” The herpes virus is most commonly spread through contact with the infected area on an individual, or any fluid or saliva that is produced from it. It is possible for the virus to be transmitted even in the absence of sores and other symptoms. Herpes can also be present on mats and other types of equipment. However, these sources are not as common. A herpes rash begins with small clusters of red bumps and irritated skin. Fluid-filled blisters are characteristic of the herpes virus, and after a few days these blisters typically flatten out and become yellowish-brown scabs. The herpes virus infects open cuts and sores, and it may take several days or weeks for herpes symptoms to become visible. Some individuals come down with flu-like symptoms just before an outbreak, experiencing fever, chills, swollen glands, headaches, etc. Identifying herpes is sometimes difficult if symptoms are not present. To correctly determine the type of herpes (if any) and course of action, your doctor will most likely take samples from the skin or blood to examine further. Herpes is one of the more serious types of skin infections. There are ways to treat it, but there is no actual cure for it. Once infected, the virus is always present in the body in an inactive state, known as “remission.” Herpes hides in cell bodies of nerves, but may become present at any time; this is known as an “outbreak.” Outbreaks occur when the immune system is weak – in times of intense stress or fatigue, or when skin damage or other illnesses occur. The symptoms during an outbreak are often less intense than the first time the virus is contracted. Again, there is currently no cure for herpes simplex. However, there are many medications that can be prescribed to you by your doctor that may help prevent and reduce the symptoms of outbreaks, and thus reduce the chance of transmission to others. Depending on the opinion of the doctor, you will be urged not to participate in practice or competition until you have taken medication for about seven days and no new outbreaks have occurred. Impetigo is a bacterial infection that can be found nearly anywhere on the body, and is caused by one of two types of bacteria: Streptococcus (strep) or staphylococcus (staph). Impetigo is usually caused by one of these types of bacteria entering the body through a cut or animal/insect bite, or any other type of open sore. However, a break in the skin is not always needed to contract an infection. Impetigo typically begins as small clusters of red bumps that break open into a yellowish scab. 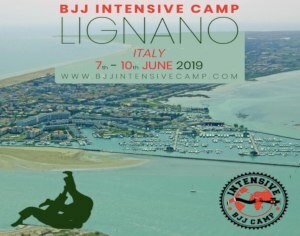 This infection may be spread by skin-to-skin contact, or by using facilities and equipment (BJJ mats especially) where the bacterium is present. Impetigo is highly contagious and, if left untreated, could cause other very serious health problems. When Impetigo appears on the skin, it typically starts as localized clusters of delicate, yellowish bumps that may increase in size and number. These clusters often cause no pain, but can be very itchy and irritating. When the blisters are popped, reddish sores are left on the skin, which will eventually crust over due to the fluid. Impetigo may cause flu-like symptoms such as headache, fever, fatigue, and also swollen glands. 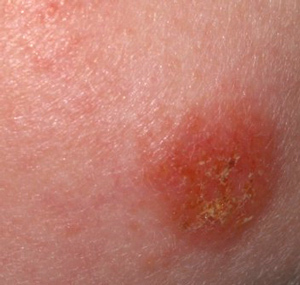 A physician can typically identify impetigo with a simple examination of the skin. Sometimes, extremely small samples of the skin are needed for a sure diagnosis. Most cases of impetigo can be treated with some topical, non-prescription antibacterial medications. For more serious cases, doctors will usually prescribe a combination of topical and oral antibiotics. Typically after one or two days of treatment, the infection becomes non-contagious, with the sores disappearing in about a week of starting treatment. Washing with soap and water before medicating may help increase the effectiveness of the medication. Staph (Staphylococcus aureus) is a group of bacteria that can cause several different infections, including impetigo. This bacterium is commonly found in the bodies of a small percentage of individuals without harm. Staph usually enters the body through open wounds and hair follicles, but can sometimes cause infection without a break in the skin. In severe cases, the infection may find its way into the bloodstream, causing other infections and health complications within the body. Staph is almost always transmitted by skin-to-skin contact. However, unclean facilities and equipment are also known causes for an infection. Staph can show up in several different forms, but mainly starts as a small sore or boil. Typically, staph invades hair follicles and open wounds, but there have been cases reported where no open cut or wound was present. The back of the neck, underarms, groin, and the beard area in men are the most common areas where staph can be found. Tenderness, swelling, and redness around the infected area are common symptoms. 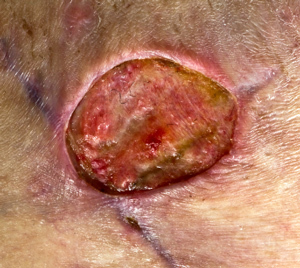 Pus and drainage are also common. It can often spread quickly, and with this comes flu-like symptoms such as fever, sweats, and chills. If left untreated, staph may cause pneumonia, and blood or bone infections. Depending on your symptoms, your physician may need samples of blood, urine, or skin for a diagnosis. Antibiotics are used to treat a staph infection. Depending on how early it is caught and how severe the case is, the type and strength of the drug(s) may vary. Typically, a combination of topical and oral antibiotics may be used. Abscesses may also need to be drained by a physician. Staph can become life-threatening. In recent years, the overuse of some types of antibiotics has been the cause of mutated forms of the staph bacteria. Known as MRSA (Methicillian-Resistant Staphylococcus aureus), this type of infection is resistant to some forms of antibiotics. MRSA has been present in hospitals and health facilities for a number of years, but since has become a type of infection that is spread among the general community. MRSA is more difficult to treat than a typical staph infection, because there are fewer effective forms of antibiotics. Serious cases of MRSA are treated with intravenous antibiotics. In any case, preventing a skin infection is much easier than treating one. If the right precautions are taken in monitoring one’s body and keeping it clean, infections shouldn’t be a cause for worry. 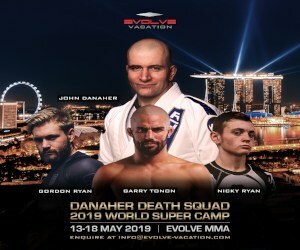 Skin infections should never deter you or you from participating in the great sport of Jiu-Jitsu, especially if you have the right knowledge and preparation. 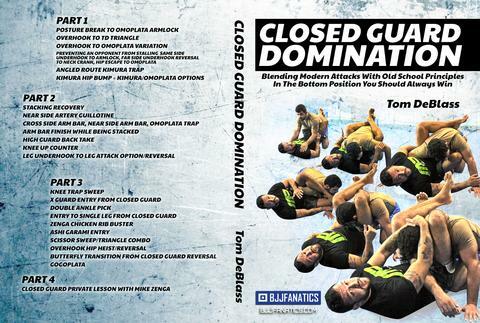 So you want to play a simple and effective half guard? 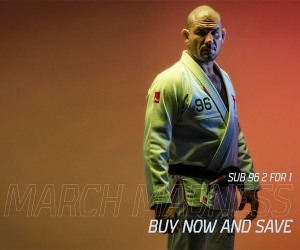 Well, get your hands on arguably the best half guard player ever, Bernardo Faria’s DVD set, “Battle Tested Half Guard.” Bernardo is infamous for his simple, effective, and tenacious half guard. He has a game that is suitable for anybody at any age, weight, gender, or fitness level!